A building housing an apartment occupied by two sons of the PDP presidential candidate, Atiku Abubakar, was reportedly searched by anti-graft operatives in Abuja over the weekend. The building also houses an apartment occupied by Chiemeka Orji, son of ex-Abia State Governor, Theodore Orji. The report revealed that the home of Mr Abubakar’s children was the primary target, but an anti-graft spokesperson suggested Chiemeka might have been the target. While no specific law enforcement agencies were immediately linked to the purported block of Mr Obi’s accounts raised by the PDP, sources informed about the raid on the home of the presidential candidate’s sons said those who executed the search were from the Economic and Financial Crimes Commission (EFCC). “The EFCC operatives then said they have intelligence that a large cache of dollars had been kept in the apartment which they had come to recover,” the source said. 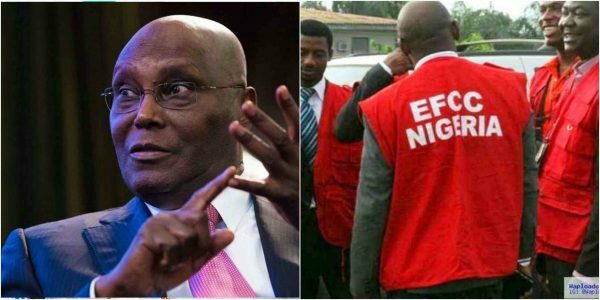 Hey Buddy!, I found this information for you: "Atiku’s Sons Apartment Raided By EFCC In Abuja". Here is the website link: https://headlinenews365.com/atikus-sons-apartment-raided-by-efcc-in-abuja/. Thank you.